They say you can’t judge a book by its cover, but these days you can most certainly judge music by its album cover, band name, or album title. When I saw the overused “unreadable etched-in-blood” font used for the band’s name, I knew what I was in for. It is not a good thing, a bad thing, or anything to be ashamed or proud of. 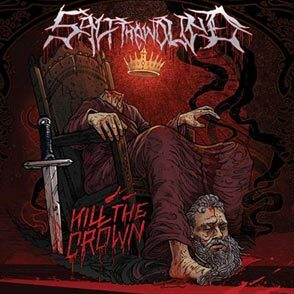 But I don’t think that there is any fan of modern metal music that wouldn’t guess Kill the Crown was going to be a cookie-cutter American metal-core album mixed with elements here and there of technical death metal. This isn’t a problem with the guys in Salt the Throne, necessarily — it’s a problem with the scene today. Yes, those guys are technically proficient in their instruments, but why should listeners care if they aren’t bringing anything new to the table? And Salt the Wound is not the only band at fault for this because for some reason we, as listeners, keep supporting the same bands with the same songs, year after year. What is it that makes them stand out from any other metal-core band? What are they adding to the scene? Hasn’t this album been done before? Haven’t they done this album before on their previous two releases? Yes, this album is probably great to thrash to at a show, but why spend money on this album? The first track started with a fade-in of eerie sounds, followed by a quick drum fill that slowed down to a battle pace, complemented by the guitars coming in and playing slightly melodic riffs at a considerably lower speed. The next tracks followed with faster blast-beat drums and faster riffs that hardly changed at all throughout the song. After the stereotypical slower “last song on the metal album that consisted of everything said before with slight symphonic elements,” there was a small hidden track at the end that was just barely over a minute long. There isn’t anything intrinsically wrong with this album, but I don’t understand the appeal. Why was nothing original thrown in? What separates this band from As I Lay Dying, or Job for a Cowboy, or any American metal-core band from the past 10 years?